"After me, there is only Caballé." "Otto Edelmann, a leading Austrian bass-baritone of the postwar period particularly known for his interpretations of Wagner and Strauss roles, had a long association with the Vienna State Opera, where he sang for 30 years, and also had a close relationship with the Metropolitan Opera, where he made his début in 1954 as Hans Sachs in Wagner's DIE MEISTERSINGER and sang until April 1976. His final Met role was Baron Ochs in Strauss' DER ROSENKAVALIER, one of his signature roles, which he first performed in 1952 at La Scala with Elisabeth Schwarzkopf and Herbert von Karajan. 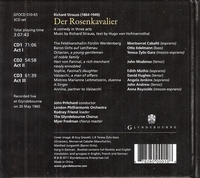 That performance is still available as an audio recording; there is also a video of a Salzburg production with the same principals.